We provide solutions able to meet the vision and goals of each client. Let wiz guide you in our wold. we will help you harness the power of the Internet. Learn about 10 SEO experiments that will change your way of thinking about SEO. We deliver intelligent full builds for adventurous brands that need a memorable brand experience. We pull digital disciplines from SEO to Content Strategy, and make them work to build your brand and meet your goals. We design & develop apps for the Web, iOS, Android and Windows. Our Ambition to turn your ideas into apps comes from our passion about programming. Wizdom looks at each client opportunity as a potential business partnership. Our payment options let your dream come to life, regardless of budget. Request a quote today and we help you get the most from your business. We offer SEO services such as a comprehensive analysis of the page, keywords selection optimization and promotion of sites on the Web and consultancy SEO / SEM . 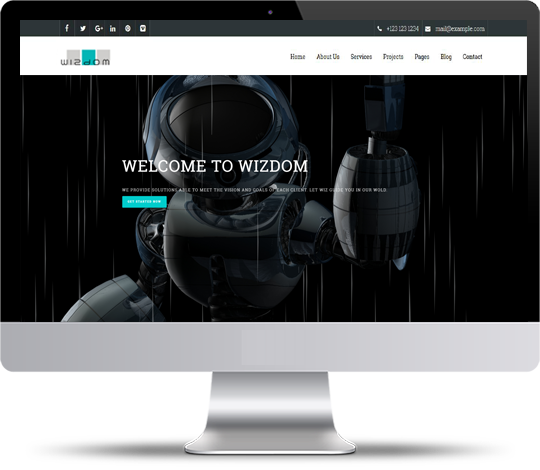 Wizdom web development agency consistently creates websites, web apps , mobile app and and offers solutions that reflect the needs, the personality and vision of our clients. The success of online and offline branding, communications and marketing strategy of your company will always be our goal. Ours seo expert maximize the traffic to your website by improving page rank within search engines. We review and analyze your website and market the appropriate changes so it is optimized for search engines. Whether it is web design, marketing campaigns, web maintenance services or the technical expertise of seasoned web developers, we invite you to tell us more and how we can help. If you are ready to design your vision, put you in touch with your customers to sell your product, or just to inform you, we will help you harness the power of the Internet. We bring truly unique and engaging art into the digital world which generates a memorable brand experience. For over 18 years, from early days of the Internet going mainstream we have been delivering the highest quality of web solutions. We develop mobile apps on all of the most popular platforms including Android, Windows and iOS. We will turn your ideas into real world-changing apps.